Meat lovers, look what we discovered this time! 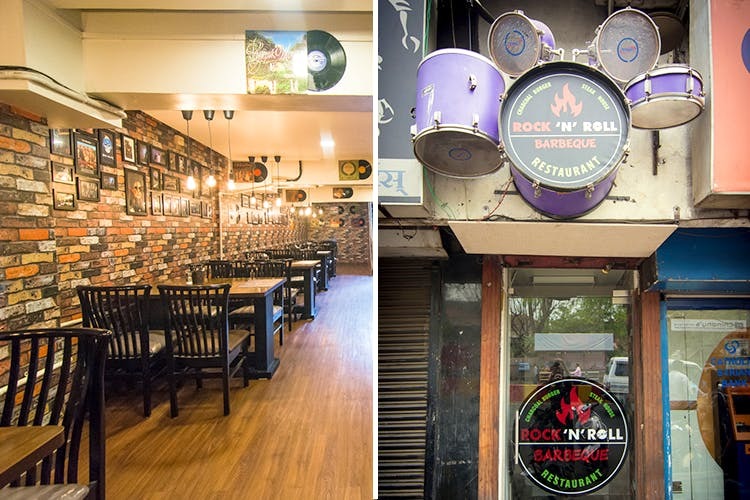 Check out Rock N Roll, a fairly new steakhouse located at Sterling Building in Moledina Road in Camp. Rock N Rock is a very vintage-looking steakhouse, something that is quite the rare sight these days. The decor is minimal and cool. Think earthy-tone bricked walls crowded with framed portraits of MJ, Bob Marley, Queen, The Beatles, AC/DC, Rolling Stones and everyone who rocked the rock n’ roll scene between early 60’s and 90’s. Additionally, there are original vinyl records of many artists (including that of Elvis Presley’s) in the place. For music, all they do is pick up any one of these records and play it on an antique gramophone that they own. How cool? Coming to the menu, the food compliments the ambience. It’s simple, fuss-free and a delight for meat-eaters. We particularly loved their ultra chicken steak and the shahi paneer burger, which turned out to be unexpectedly yummy. And since everything has a slight 90’s touch, the Rock N Roll mocktails are named after characters from F.R.I.E.N.D.S. So expect everything from a Rosy Rachel mocktail to Ms.Chanadlar Bong mocktail. We went for Monica’s Pango Mango that had a nice tangy kick from the mango and peach pulp. Tag the gang and head to Rock N Roll Steak House for some great foot-tapping music and meaty meals.